The Castle Serenity is a popular favorite among pellet stove enthusiasts, and has rightly earned its place as a top selling model on Amazon. Castle really thought out the whole user experience, and this stove is near perfection. What makes it so special? A combination of smart design, easy to use features, and high quality manufacturing. Let’s take a further look! ✔Programmable:The unit has a built in thermometer and features a 24 hour programmable controller for each day of the week. This allows you to set times for the stove to be on/off, which means you can wake up warm-have the stove turn off while you’re at work-and have it turn back on 30 minutes before you arrive back home. This feature will save a lot of pellets, while ensuring you don’t have to suffer through the cold. There are also five levels that you can set the stove to burn at depending on the heat intensity you desire. The burn time ranges from 12 hours (highest setting) to 24 hours (lowest setting). This level of control is rare on such compact product. ✔Easy to Clean:All that needs to be done is a quick sweep of the exhaust pipe and a dump of the ash pot. The interior of the stove is smooth to prevent ash buildup and make any additional cleaning easy. ✔Customer Support: Castle offers live customer support on its products, which means that in the event of shipping damage or a part malfunction it is easy to get into contact with a helpful representative. Just to give you some examples of the level of care we are talking about here, there was a man who received a defective stove part-he calls up Castle-the free replacement gets sent out the same day. Another guy who just wanted to talk with someone to make sure installation had been done correctly-2 calls to Castle over a 3 day period later-problem solved and he’s buddies with the guy on the line. If anything is wrong Castle will make sure to send you a free replacement stove, from what we’ve read about these guys they are the real deal. There’s not much to dislike about this stove, because many of the errors are due to users who don’t read the manual or those who don’t understand you need to “cure” your stove. Curing means letting it burn 2-3 times outside while all the oils in the interior/exterior paints are “off gassed.” This process can be done indoors as well, just make sure the room is heavily ventilated. ✖Tight Hopper: While the hopper is the standard 40lbs, there is very little wiggle room. Essentially, if you try to add another bag of pellets while the hopper is still slightly filled-there will be overflow. ✖No Ambient Temp. Turnoff: This one was discovered by some of the users who set their stove for a certain ambient temperature. Once the ambient temperature reached the setting the stove would not turn off; it simply switched to its lowest setting. This could pose an inconvenience to some users. We look at stoves frequently, and few stand out as much (for positive reasons….) as the Castle Serenity. 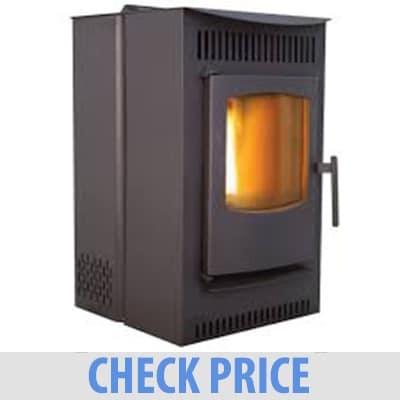 This product is perfect for someone with little to no log/pellet fuel burning experience. Between the great features, strong performance, and fantastic customer support this is truly one of the best pellet stoves of 2017.